#7205 Cuddler Cuties "Wendy Workout"
Description: Wendy Workout is one of the Cuddler Cuties Smooshees sets that were sold with a human-type Smooshee figure, a removable one-piece outfit, and a bag that the Smooshee can be smooshed into. This set was designed for children ages 4 years and older. 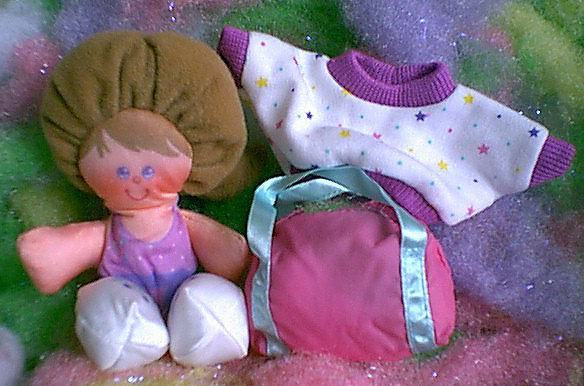 FPT16396 - Wendy - Small stuffed Smooshee girl with brown fabric "hair" and a pre-printed face and clothing. Wendy has blue eyes, a pink nose, round pink cheeks, and a pink line smiling mouth. Wendy has a hot pink printed sleeveless outfit with a purple belt. The top section of the pink outfit is covered with white polka-dots. Wendy also has white printed shoes with blue printed shoelaces. *See "Variations" below. FPT14948 - White shirt with multi-colored dots and stars on it. The shirt has a blue collar, blue sleeve cuffs, and a blue edge across the bottom of the shirt. *See "Variations" below. FPT14950 - Purple rectangular gym bag with 2 blue 1/8" wide satin ribbon straps that form 2 carry loops on top. The top of the bag has an opening to smoosh a Smooshee inside the bag. *See "Variations" below. 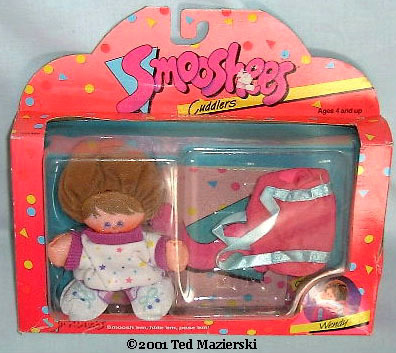 FPT14970 - Wendy - Small stuffed Smooshee girl with brown fabric "hair" and a pre-printed face and clothing. Wendy has blue and purple eyes, a pink nose, round pink cheeks, and a pink line smiling mouth. Wendy has a light purple printed sleeveless outfit with a dark purple belt. The top section of the outfit is covered with tiny white polka-dots. Wendy also has white printed shoes with aqua-green printed shoelaces. FPT14971 - White shirt with multi-colored dots and stars prints. The shirt has a purple collar, purple sleeve cuffs, and a purple edge across the bottom of the shirt. FPT14972 - Pink rectangular gym bag with 2 aqua-green 1/8" wide satin ribbon straps that form 2 carry loops on top. The top of the bag has an opening to smoosh a Smooshee inside the bag.